A magnitude 6.7 earthquake struck Alaska on Nov. 30, centered about 7 miles north of Anchorage, according to the U.S. Geological Survey. 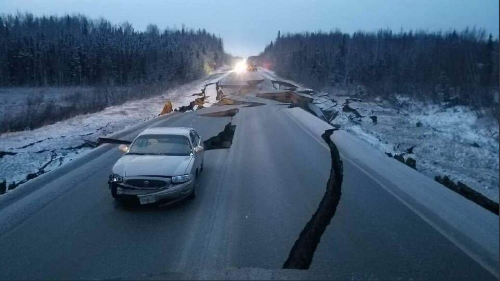 The Alaska Department of Transportation & Public Facilities immediately deployed crews to inspect roads and bridges following the quake, while also placing its Alaska Marine Highway System on alert due to Tsunami warnings issued by the National Weather Service; warnings which were subsequently cancelled by the NWS. Outgoing Gov. Bill Walker (R) issued a declaration of disaster following the earthquake and noted in a Facebook post that he has established an incident command center with Major General Laurie Hummel, adjutant general of the Alaska National Guard, at Joint Base Elmendorf and Richardson. “We are closely monitoring reports of aftershocks and assessing damage to roads, bridges and buildings,” Gov. Walker said. The Alaska DOT&PF – which oversees 239 airports, 10 ferries, plus more than 5,600 miles of highway and 731 facilities – added that it also received reports of a rock slide by McHugh Creek, which blocked and subsequently closed part of the 125-mile long Seward Highway, which connects Anchorage to the town of Seward to the south. Alaska is the most seismically active U.S. state, according to USGS, and is the site of the second-largest earthquake ever recorded – a 1964, magnitude 9.2 earthquake in Prince William Sound that caused extensive damage throughout south-central Alaska and generated a Pacific-wide tsunami.